Justin Neely, Director of the Language Department at Citizen Potawatomi Nation, is on the agenda to speak about the family clans that existed within the Tribe decades ago. Justin is one of the Nation’s authorities on our family histories, early cultural traditions and, of course, the Potawatomi language. I think we can all look forward to this opportunity to learn more about our individual family histories and the makeup of the Tribe’s early familial structure. Following his presentation, a catered lunch will be served. A presentation by Connor Bickford about his Potawatomi Leadership Program experiences last summer as well as the presentation of the traditional gifts to the eldest, youngest and farthest-traveled member are on the agenda after lunch. Please RSVP by 5 p.m. April 17 by calling me at 785-608-1982 or emailing me at jon.boursaw@potawatomi.org. You can also call Lyman Boursaw at 785-584-6401; toll-free 1-800-880-9880. Please indicate which meeting you plan to attend. We begin the meeting with a catered lunch at 1 p.m., followed by the unique opportunity to hear about the CPN Indian Child Welfare Program from its director, Janet Draper. This program operates within the judicial branch of our government. It is a program we don’t hear much about. Although it is one of our smallest, it is one of the most important and effective programs we have within Tribal government. 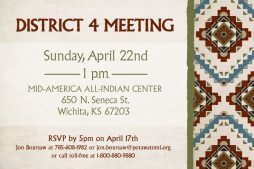 This will be the first time Janet has spoken at any of the District meetings in Kansas. Personally, I’m looking forward to Janet’s presentation, and I hope you are, too. I will cohost this meeting with District 1 Rep. Roy Slavin. 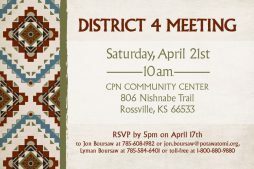 This meeting is for the convenience of District 4 members in the Greater Kansas City area and the eastern portion of Kansas but is open to any CPN member. We invited Jennifer Bell, CPN Director of Public Information, to discuss her role in handling public information and public relations functions for the Nation. As you imagine with the numerous issues, events and her routine daily responsibilities, she is a very busy person. Her department is responsible for publishing and distributing the Hownikan, and I think we all agree that we have seen a significant improvement in quality and professionalism of the Hownikan over the past few years. I also asked Jennifer to give a brief overview of current issues and activities involving the Nation. A catered lunch will follow her presentation. Following lunch, we will present the traditional gifts to the eldest, youngest and farthest-traveling member. 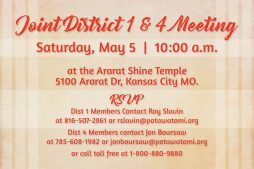 Ararat Shrine is located off of I-435 at exit 65 (Eastwood Trafficway), which is just south of I-70 on the east side of Kansas City. Turn west onto Eastwood Trafficway then right at the first light, which is Ararat Drive. You will immediately see the Ararat Shrine building on your left. Please park in the back; there will be staff available to direct you to the parking area. Handicap parking is available in the front of the building. Please RSVP by 5 p.m. May 1 by calling me at 785-608-1982 or emailing me at jon.boursaw@potawatomi.org. You can also call Lyman Boursaw at 785-584-6401; or toll-free 1-800-880-9880. Please indicate which meeting you plan to attend. The April Elders Potluck is noon, April 13 in the CPN Community Center in Rossville. The Senior Support Network staff has asked that you RSVP if you plan on attending. Their number is 785-584-6171. Don’t forget the 2018 CPN Family Reunion Festival is June 28 to July 1 near Shawnee, Oklahoma. The honored families this year are Anderson, Beaubien, Bertrand, Bourbonnais, Ogee, Pettifer, Toupin, Wano and Yott. As always, it is my pleasure to serve as your Legislative Representative.